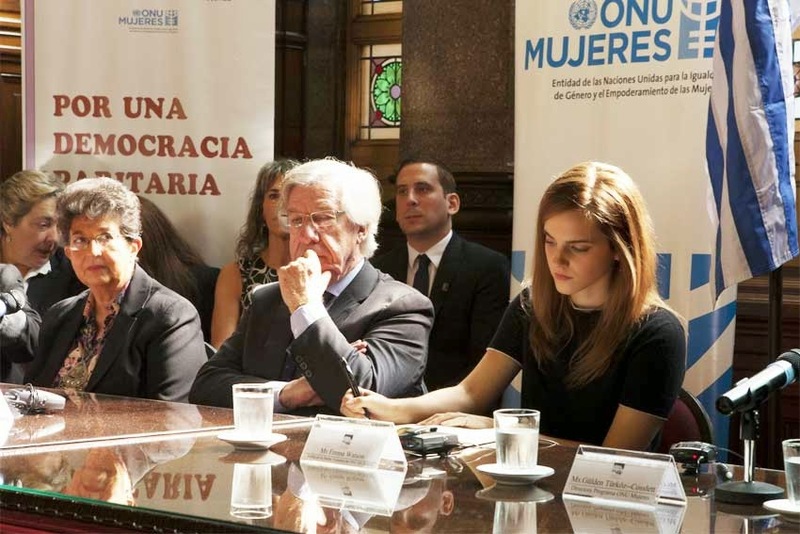 18 September 2014 – On her first country visit as UN Women’s Goodwill Ambassador, acclaimed British actor Emma Watson in Uruguay highlighted the need for women’s political participation as the country gears up for elections with a first-ever national quota law guaranteeing 30 per cent women’s representation. “Women must have a say in matters that affect their countries, communities and families. After all, they are half of the population, so women’s equal participation in decision-making is a question of justice and democracy,” Ms. Watson said yesterday in the Uruguayan capital, Montevideo. The meeting Ms. Watson attended was hosted by the organization Cotidiano Mujer, a grantee of UN Women’s Fund for Gender Equality, together with partner organizations CIRE (Ciudadanías en Red) y CNS Mujeres. During her visit, Ms. Watson met with women’s advocates from around the country, and listened to their strategies for increasing women’s voice and agency across all political platforms. She also met with top Government officials and young women politicians and will participate in an event where women’s rights activists will submit signatures calling for an extension of the national quota law. The event is the culmination of the “Do your bit for the quota” campaign, launched in July. “Emma is a strong voice for young people worldwide. Her commitment to the issues that we work on at UN Women multiplies our ability to reach and engage more young people – who are key to advancing gender equality,” said UN Women Executive Director Phumzile Mlambo-Ngcuka, in a press release. “Women’s rights are personal to me, especially on political participation and leadership. I am delighted to be here…as a Goodwill Ambassador for UN Women and learn about the work on the ground, hear from the people at the frontlines, and to understand what is working and what is not,” said Ms. Watson during her visit. To change that, women’s groups in Uruguay have been galvanizing support by leveraging the quota law, and by strengthening alliances between the women's social movement and political parties. “I have learned that it is also a question of priorities, as women are more likely to focus on issues such as education, health, unpaid care economy and the environment. These are important issues that affect all of us,” she added. On Saturday, Ms. Watson will be at UN Headquarters in New York co-hosting a special event for UN Women’s HeForShe campaign. The event aims to kick-start one of the largest solidarity movements of the 21st century for the achievement of gender equality by calling upon half of humanity in support of the other half. According to UN Women, over the next 12 months the HeForShe campaign intends to mobilize one billion men and boys as advocates and agents of change in ending the persisting inequalities faced by women and girls globally.